Some french fries have a few unusual marks on them. These marks, which are best described as small black spots on the french fry, are something that fast food lovers around the world have become accustomed to; but if you're trying to cut back on your sugar intake, you may be surprised to know that those black spots on fries are pockets of sugar. The reason for these spots appearing on your delicious deep fried snack is because if french fries are stored in a refrigerator, part of the starch on the potato turns into sugar. When the fries are being cooked, the high temperatures cause the sugar on the outside to cook before the inside is fully cooked, which leaves black marks on the fries. 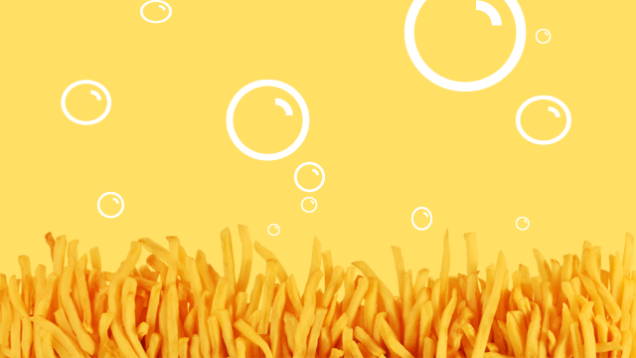 To get rid of these spots, all you have to do is let your fries sit in water that is 90 degrees Celsius for a few minutes! This process will cause the sugar on the fry to spread out evenly and your snack will become an even color.